Er det ikke fint? Jeg synes selv at det er lykkedes mig at lave en super-flot farveholdning denne gang! Fibrene kan købes her, i webshoppen. Desuden er der hele måneden lavere pris på den aktuelle farve, lige godt 10% lavere end tilsvarende produkter. Slet ikke tosset, vel? Hurray, it works! The fiber preparation that I’ve been working on and testing seems to perform the way I intended it to: easy drafting, easy spinning and a fun and interesting yarn! 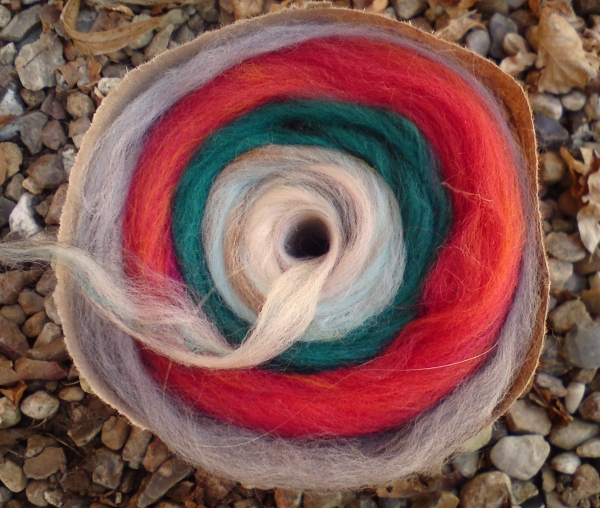 This is a 3-ply yarn spun from the roving I showed in my previous post. Even though ther was some thin spots in my test-roving it was a pleasure to work with. I spun the singles on a spindle with the roving standing besides me in it’s paper-cover. Worked just perfect! It didn’t break (only in a few places where the roving was very very thin..) and it didn’t collapse when I got to the outer layers of fiber. 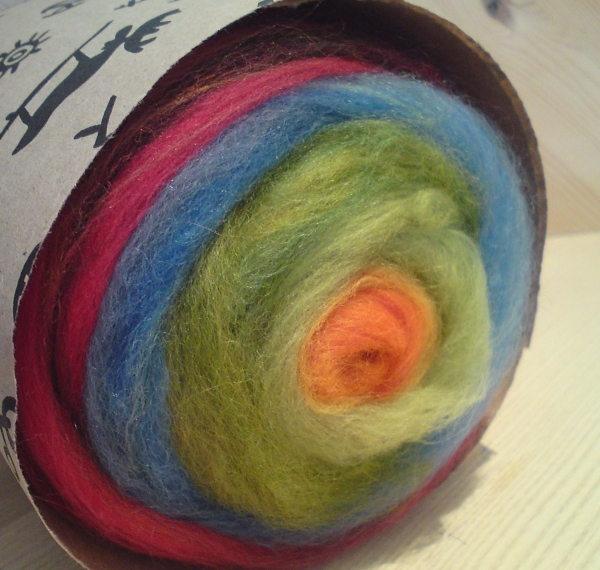 After spindle-spinning it I n-plied the yarn on my Kromski Symphonie wheel. 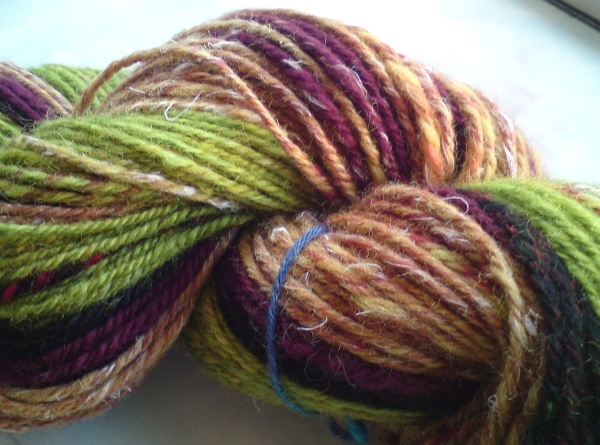 the resulting yarn is soft and tweedy. With its 4 colors it would be good to use for a cowl, a hat or something like that. 80 grams and 174 meters. To knit this I would pick up a needle size 4 or 4½ mm, as a starting point. This one is allready sold.. It has 8 soft spring-like colors and weighs about 80 grams. They both have 8 colours. The first one weighs approx. 80 grams, the next one 86 grams. 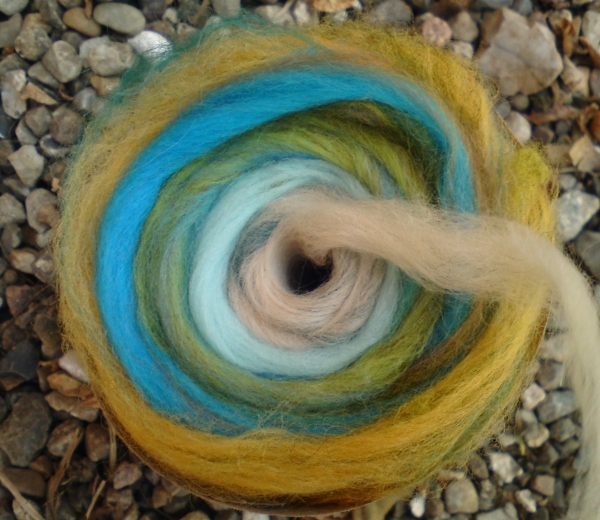 The fiber content in both of them are mostly merino, but also a little shetland wool, alpaca, BFL and some locks from an unknown Scandinavian sheep-breed.